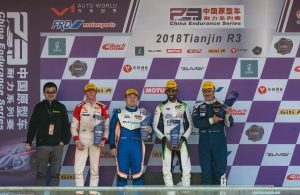 Eurasia Motorsport saved the best to the end when they secured a superb second and third position finish to conclude the China Endurance Championship in style today at V1 Auto World Tianjin, China today (11 November). In addition, Martin Cao claimed the Mix Team Champion, awarded to the highest-ranking Chinese driver. The first race of the weekend was the replacement for the typhoon hit cancelled race at Zhuhai. Cao in the #3 car had qualified on the front row at Zhuhai but started in P4 due to the entry having one new driver, Henning Enqvist. The #22 car started last, the penalty for having two new drivers to the car – Garnet Patterson and Constantin Scholl, the former starting the car. At the start the front-runners ran wide at turn one, allowing the #95 car to take the lead from #5 with Martin Cao in third place. Patterson crossed the line in sixth place at the end of the first lap after a great first lap. The top three ran nose-to-tail on the semi-street track until lap five, when the first two collided at T13 allowing Cao to take the lead from #5 and #95. It was a lead Cao held all the way to the pit stops, handing over to Enqvist on lap 20. Patterson meanwhile was up to third when Scholl took over. After the pit stops cycled through Scholl led from Enqvist, the former spending 20 seconds less in the pit lane due to his bronze rating. Most of the opposition now had their lead drivers in the car and were hounding down the Eurasia novices. However, it was looking good for an excellent result unless there was a safety car to bunch the field and unfortunately this came with 10 laps to go when #18 spun. After a frantic chase to the flag Enqvist finished fourth with Scholl in fifth. The second race of the weekend, effectively the opening race of the event, saw Enqvist and Scholl start. The finished lap one in seventh and eighth and spent the following four laps swapping places before Enqvist settled into a rhythm and consolidated seventh place with Scholl in eighth. After the pit stops Patterson emerged in fifth following a tight battle with the #18 and #5 car. Cao tagged on to the tail of the four-car train, the tight group putting in an entertaining battle to the flag with Patterson finished fifth and Cao seventh. The final round of the championship saw Patterson start fifth and Cao sixth. A chaotic first lap saw Cao come by in second and Patterson in third. Cao quickly pulled away from a tight group with Patterson fighting to stay in front of a train of three cars. After a few laps Patterson was also able to pull away. The team ran the cars until the end of the pit stop window, at which point they ran first and second. During the pit stop the safety car was called due to a large accident for the #1 car at T11. At the re-start Scholl was in a safe second in the #22 car from Enqvist in the #3. The latter fending off the #95 car of James Winslow to the flag to finish third.